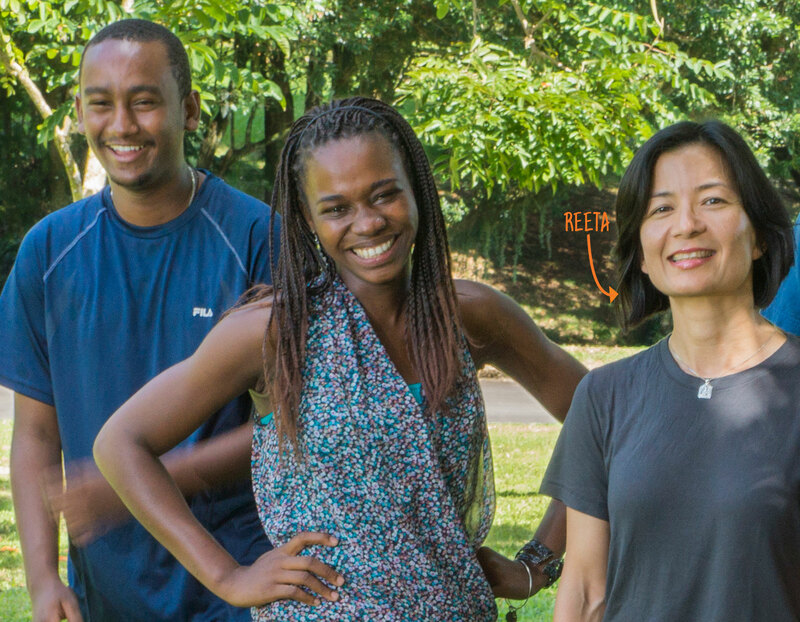 Every year, EARTH University’s model reaches new corners of the world as our graduates step out as global citizens, carrying the University’s vision, mission, and values with them. This past year, we celebrated our 20th commencement ceremony. Watching the students take their diplomas in hand served as a reminder that universities throughout the world can prepare great doctors, teachers, engineers, or agronomists, but without values, without forming students into honorable leaders committed to serving society, their degrees will do little to solve our most urgent social and environmental issues. What we teach at EARTH we see validated and reproduced through our graduates and the impact they are already making in society, and we are more convinced than ever that education is the best investment we can make to change lives and reduce poverty. For this reason we recruit young leaders from the poorest communities of the Americas and Africa, representing for many of our students a once-in-a-lifetime opportunity to go to college. We are truly thankful for the donations, support, and encouragement that have carried the University to where it is today and enabled more than 1,700 young people to discover within themselves the capacity to positively impact our world. 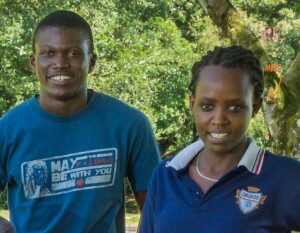 In 2012, the first cohort of 40 students of The MasterCard Foundation Scholars Program began their four-year journey at EARTH. In addition to being one of the largest partnerships in our University’s history, we are proud to be part of this broader $500 million initiative through which The MasterCard Foundation, with partners like EARTH, are inspiring young people to lead positive change. By the fact that they are here at EARTH, we are already changing the trajectory of their lives, and in so doing, we will be impacting and influencing the lives of people we will never meet, because of what they will do in their lifetime. We hope that they leave EARTH and become role models for others…that they, just by their own leadership, inspire others to also push for greater equity in this world, create opportunities, to have empathy for each other. 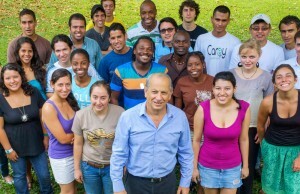 120 Scholars from disadvantaged communities in Latin America, the Caribbean and Africa receiving a first-class education that will prepare them to go back to their countries to spread their knowledge, create opportunities and respond to the issues of inequality, food security and the effects of climate change. Expanded geographical reach and impact. With the help of The MasterCard Foundation we have been able to increase recruitment of African students from approximately 7% of the entering class in 2011 to nearly 17% of the 2012 and 2013 classes. On campus today are students representing 12 African nations, including for the first time in EARTH’s history Rwanda, Tanzania, Ethiopia, Senegal and Zimbabwe. $20 million over seven years is helping us strengthen African admissions, student services, communications and other areas, while giving us breathing room to allow our Endowment to continue its recovery from the market declines caused by the 2008 global financial crisis. I’m very sure that with the knowledge I’m going to gain at EARTH, I’ll be able to transfer it to my country and teach people. I want to start a business, and then teach others how to run businesses so we will be able to employ more people and end unemployment. And I’ve already learned how to appreciate diversity while at EARTH. The fact that we are different can enable us to help one another, and so I will be able to unite our communities. I believe that is the first step of development: once we commit ourselves to put our efforts together, then we can develop our region, our country, and our world in general. Annet is from the village of Nyagatare in eastern Rwanda, which she explains faces the challenges of inadequate agricultural production, youth unemployment and the need for unity and reconciliation following the 1994 genocide. 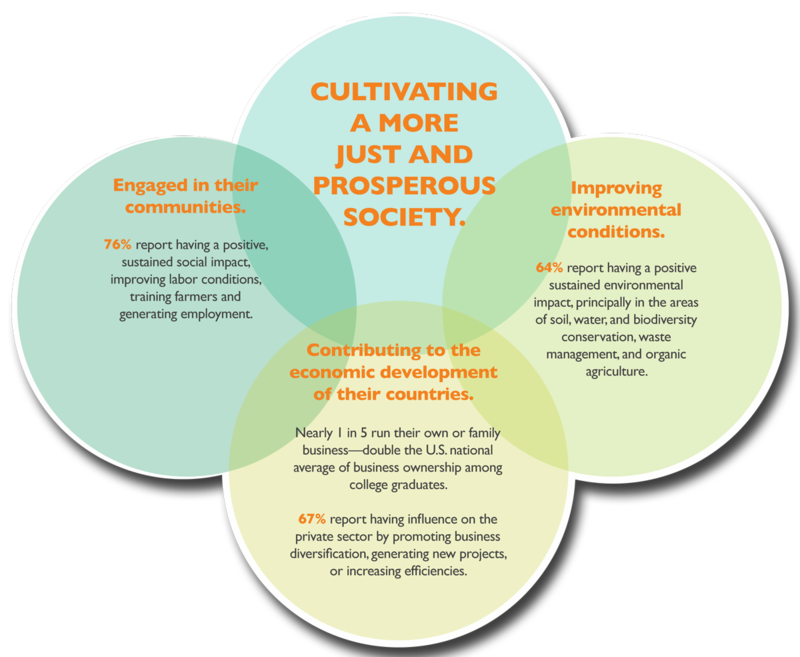 who now form part of an international network of young people committed to working together to plant prosperity and justice. 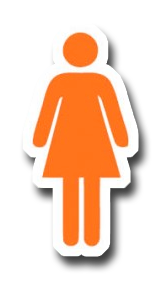 student representation is among the highest in our history, helping contribute to closing the gender gap in education in disadvantaged, rural communities around the globe. with the remaining students receiving significant financial aid and /or educational subsidy. Together we are empowering hundreds of highly-promising young leaders from economically underprivileged communities. When I started here what impressed me first was the number of nationalities there were among the students. The most important thing I’ve learned is that we all have something to share: different cultures, different histories, and in our worlds, each of us has a role to play. We tend to think that our country, our town, our region is all there is. And at EARTH, when we start our four years of study, with all these people from all over the world, we learn to have a holistic, global vision. There is always a greater motivation to do more, because you realize there are many regions where there’s poverty, that need change, that need solutions. Our University cradles all of those solutions that are needed in our regions. So, it depends on us students, who come from everywhere. How can we take these solutions and share them, spread them? 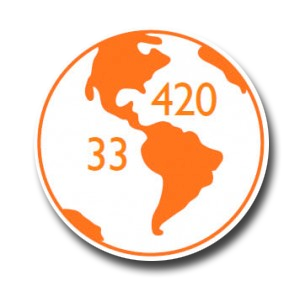 1,725alumni from 29 countries in the Americas, the Caribbean, Africa, Asia and Europe spreading EARTH’s positive vision of a more sustainable future. 87% of alumni are in their countries of origin contributing to strengthening the social, environmental and economic well-being of their communities and nations. 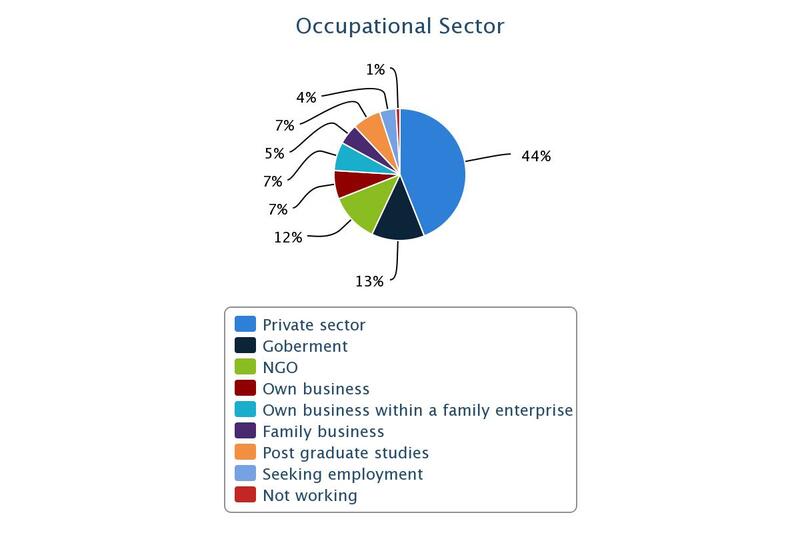 Results of our 2012 alumni impact survey, with responses from 56% of alumni. 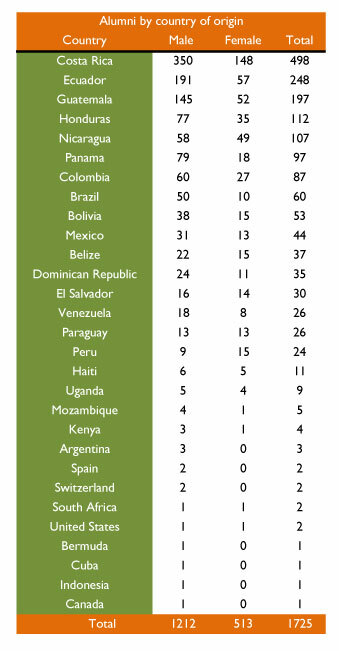 Alumni by country of origin. EARTH has been – and for me, still is – more than a stage of professional preparation, it is also a process of strengthening the human spirit. EARTH’s courses and community life are infused with respect for nature and cultural diversity. With this, ties of responsibility, solidarity and tolerance are put into practice and become principles for living. 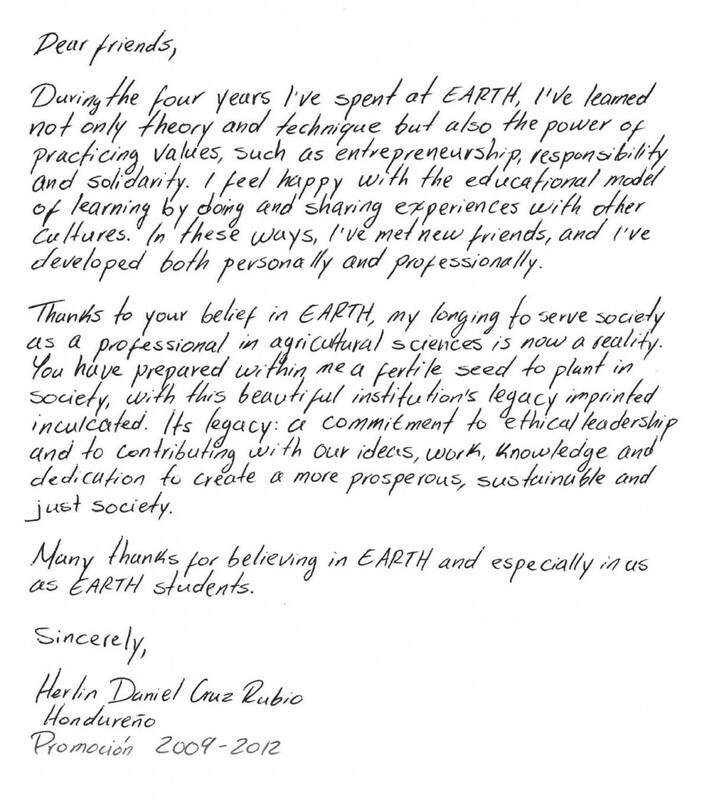 As time passes, I also realize that EARTH has been a turning point in my path; my years and experiences at the University have translated into a capacity to do both specialized and multidisciplinary work in sustainable agriculture, with a global vision rooted in local experience and the fabric of society. My work on sustainable development projects, research in biosafety and international environmental negotiations that I am currently doing would not have been possible without the academic preparation and human values I’ve carried with me from EARTH. Georgina is currently an FK Norway exchange researcher at SEED (Society, Ecology and Ethics Department) of the GenØk Centre for Biosafety. She is researching how knowledge, science and technology from different agricultural production systems may contribute to the achievement of the Millennium Development Goals (MDGs). 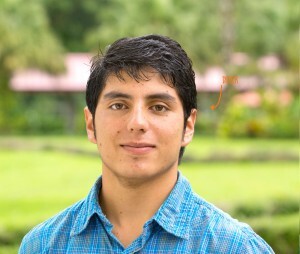 In 2012, total expenses increased by 13% with respect to 2011 due to the need to cover campus security improvements, equipment replacement and capital investments, as well as the effects of currency exchange rates and inflation in Costa Rica. There was a $532,500 budgetary surplus, principally due to savings in operational costs. Commercial operations contributed $737,000 in cash and in-kind donations to EARTH, continuing its growing role in ensuring EARTH’s financial sustainability. 11.3% return on U.S. invested assets (compared to a decline of -3.2% in 2011). 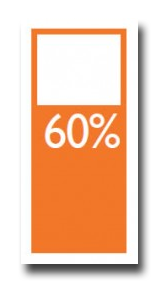 Trust transfers to the University in 2012 exceeded the Trust Spending Policy, which establishes a maximum of 6.5% annual disbursements. While this higher spending is not sustainable in the long-term, it was necessary and planned for, and actions are being taken to lower Endowment spending rates considerably over the next 10 years. As of December 31, 2012, the Trust’s total assets were $93.8 million, with $88.6 million invested (compared to $93.8 million and $89 million respectively in 2011). Trust transfers to the University were $9.1 million compared to $6.9 million in 2011. This increase is due mainly to needed investments for enhanced campus security, capital investments and equipment replacements, and a shortfall in unfulfilled scholarship pledges. Conclusion of a study commissioned by the University in 2012 to evaluate the performance and management of the EARTH Trust. $8.8 MILLION RAISED to deliver a highly individualized and experiential education to more than 400 deserving young leaders. 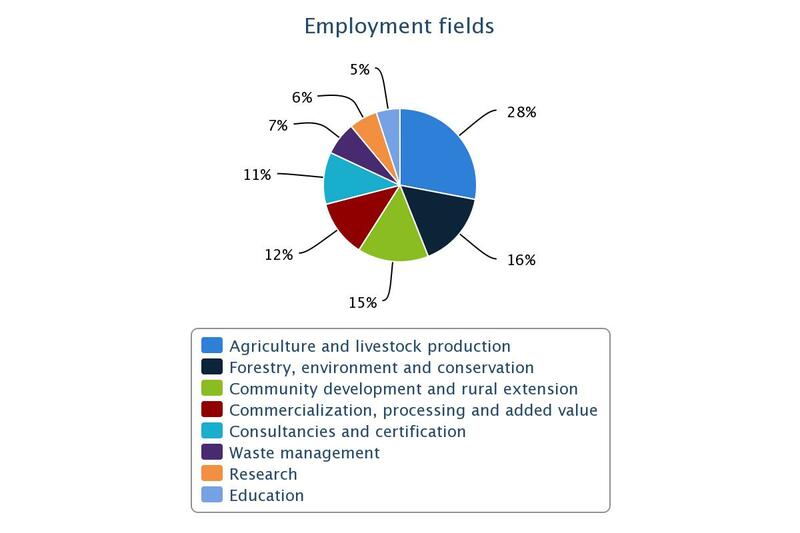 The successful DIVERSIFICATION of fundraising efforts, with nearly 50% of funds raised directed to support operations, programs and projects (compared to just 30% in 2011)—critical for maintaining quality in the face of unfavorable regional economic conditions and a reduced capacity of our Endowment to cover operational costs. Alumni showing their belief in the value of an EARTH education by donating $14,500 in a single month as part of an end-of-year alumni annual fund campaign. 130 LONDONERS learning about EARTH’s positive vision and approach for cultivating a more sustainable future during two events in London—one at the Whole Foods Market in Kensington High Street in April and a second in September at the Canning House. From its headquarters in Atlanta, Georgia, the EARTH University Foundation, a registered 501(c)(3) public charity, directly supports the educational mission of Costa Rica-based EARTH University through generous gifts from the global community and other programs and initiatives. We recognize and appreciate the generous support of the following donors whose gifts were received from January 1-December 31, 2012. These individuals, businesses, foundations, governments and international organizations make the continued fulfillment of our mission possible. The Edward Colston Foundation Inc.
Mr. Randal C. Teague, Esq. Mr. James H. Duncan, Jr.
Kathleen S. Brooks Family Foundation, Inc. Following his graduation in December 2012, Herlin returned to his native Honduras for a training program with the sugar cane processor Azucarera Grupo Pantaleón. He also plans to look into starting business feasibility studies to start his own company. Purchase EARTH products at Whole Foods Market. Tell your friends about how EARTH is changing lives, one leader at a time. 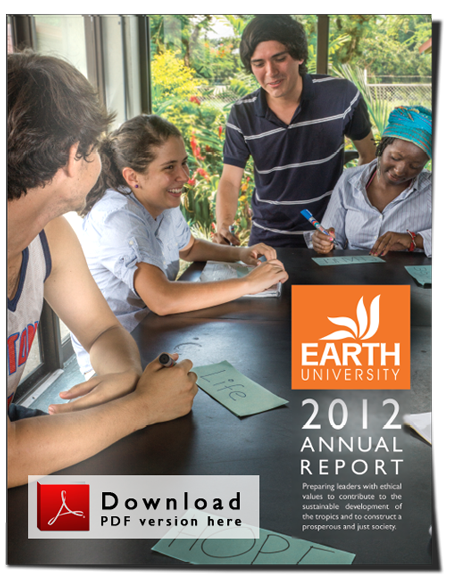 EARTH University 2012 Annual Report. Copyright © 2013. All rights reserved.